How to Easily Master Format LG Q8 with Safety Hard Reset? Tips and trick to fix LG Q8 (H970) problems. This is Android smartphone from LG which use 5.2 inches LCD screen with second LCD at 160 x 1040 pixels. This phone use Qualcomm MSM8996 Snapdragon 820 processor and have internal memory 32 GB, 4 GB RAM for multitasking. The first release in the market using Android Nougat 7.0. The main advantages of LG Q8 (H970) is dual camera 13 megapixel with aperture number f/1.8 and 8 megapixel with aperture number f/2.4 with OIS and dual led flash. 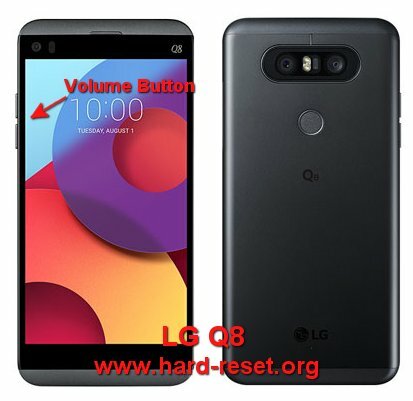 Find more information about how to solve problems of LG Q8 (H970) at www.hard-reset.org community. What is Advantage of LG Q8 (H970) Specifications? The LG Q8 will do the master reset process. The LG Q8 will continue master reset, wait for several minutes until the phone start like new again. How to Unlock or Fix or Bypass or Solutions for LG Q8 (H970) forgot password code or security lock screen pattern or pin (lost password)? The good features of this phone that release interesting is about dual camera lens at main camera which located at back side of body. First camera comes with 13 megapixel and the second camera use 8 megapixel for wide angle photo. Bellow the main camera, we can find fingerprint sensor. Why should we use fingerprint? Basically when the first time we use LG Q8, the fingerprint is not active and the screen is not locked. We need to activate fingerprint sensor from menu Setting and register our fingerprint to make this phone can recognize our fingerprint hand. We strongly suggest to give security protection at LG Q8, because we will have many private pictures / videos and a lot of important data that should not seen by unauthorized people. If we do not like to use fingerprint, then we can use screen lock pattern or password pin protections to secure our data. The problems will be happen when we forgot security answer or can not open with finger scan, what should we do? Is That Any Secret Code for Doing Format LG Q8 (H970) ? There is no secret hidden code for LG Q8 to make it back to factory default. Do the options above to hard reset it. How to Format or Erase Phone Memory at LG Q8 (H970) ? There are two phone memory type at LG Q8 , one is internal memory and the other one is external memory. If we want to format internal memory phone then we have to do hard reset or reformat the operating system of LG Q8 as well. Please use menu setting to do hard reset or reformat using #option 1 above, but make sure to give checkbox mark at Erase Internal SD card / Internal storage. Then it will reformat the factory default operating system and remove or erase any data inside internal memory. How to Make Battery of LG Q8 (H970) Stronger, Life Longer and Not Fast to Drain ? The battery of LG Q8 (H970) use 3000 mAh battery capacity. Is it enough? Depend on what we do at this phone. For some users who use LG Q8 for standard activity can work full one day without recharge. However, some users maybe have a lot of social media community chat or watch several full movie or playing games for several hours, then LG Q8 (H970) battery will not enough. We can not change / replace LG Q8 (H970) battery easily. How to make this phone battery work longer? We have to do some adjustment. First we have to make LCD screen brightness as low as possible, because more bright the light on, then more battery power will use. Second we have to disable all not use connections such as GPS or Wifi or Bluetooth or NFC. We have some shortcut from notification bar to activate each connection when we need. Some apps will need to know our locations, please activate GPS battery saving mode from menu Setting > Location. How to Easily Master Format ASUS ZENFONE 5 LITE ZC600KL with Safety Hard Reset?